Finally! 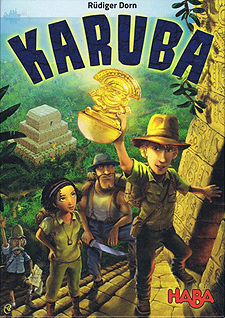 After a long boat trip, you have reached the island of Karuba and can go on the hunt for hidden treasures. Lead your expedition team along a smart route through the jungle trails, pay attention to the other players, and above all start running in time, because only the first plays will secure the most valuable temple treasures! Everyone receives the same, shuffled jungle tiles... but who will be the one to lay down the fastest routes on their island? Think carefully about when to discard a tile in order to lead the adventurers towards the temple. Once an adventurer reaches their temple, he receives a temple treasure. Whoever is able to secure the most precious treasures wins the game. Really enjoyable family-weight game. Mainly a puzzle, but the game does have strategy and has the benefit of next to no downtime as it is simultaneous play! Each player has the same numbered jungle tiles and the same layout on their board, and they have to get their different coloured adventures to the relevant coloured temple in order to get points. The sooner they get there, the more points they get! On the way they can pick up gems to score points as well. As the tiles are drawn bingo-style, each player picks up the corresponding tile and places it on their board. They have to lay a path to the temples and try to get there sooner rather than later. The game is simple and fun, and quick to play. Production values are good, and the artwork is really nice. Several boxes can be combined to make a mega-game!